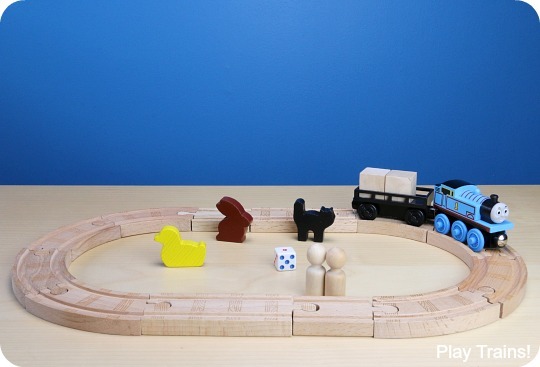 I was getting ready to photograph a different portable train set, one we’ve taken with us many times in the past, when I had an idea. No, a challenge. 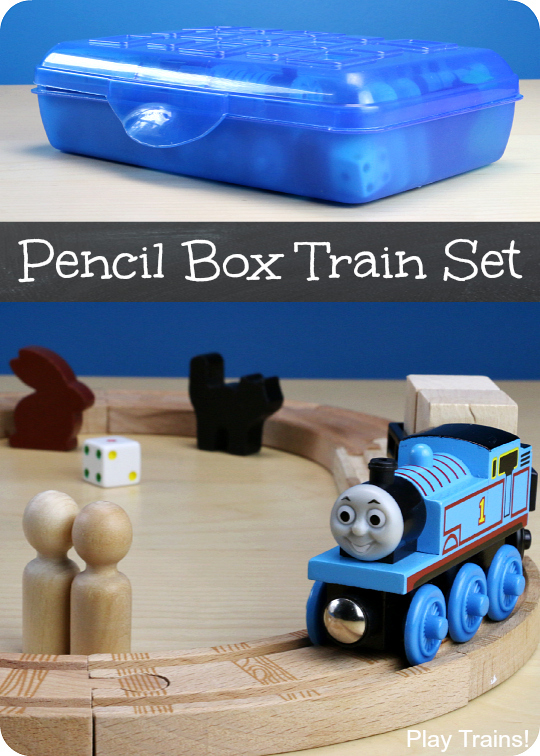 I managed to fit a train small world in a pencil box, I thought. 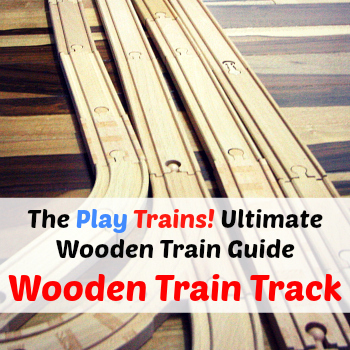 I would be pretty awesome if I could fit a complete wooden train set in one. Challenge accepted! 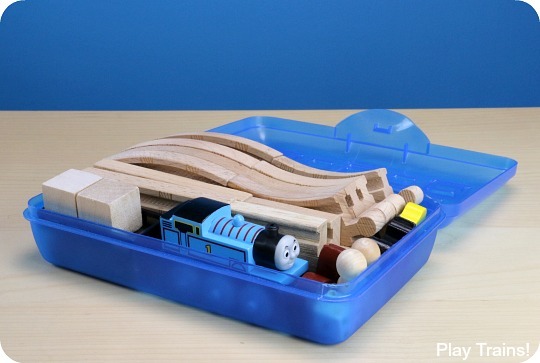 Well, the answer is yes, you can fit a wooden train set in a pencil box. 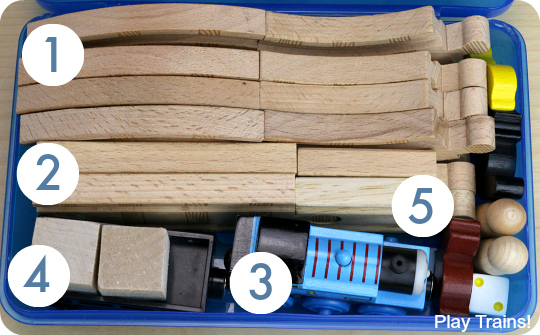 Not only is this little travel train set complete, it’s also more complex than you’d expect for how small it packs up. 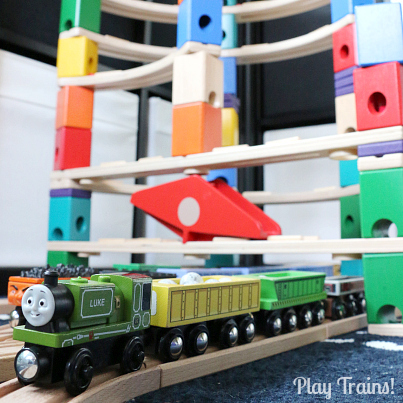 There are two possible track layouts that connect up — the difference between them is small, but I’m proud of it — and the room I’ve carved out for accessories allows you and your child to change up the pretend play possibilities every time you pack the set up. 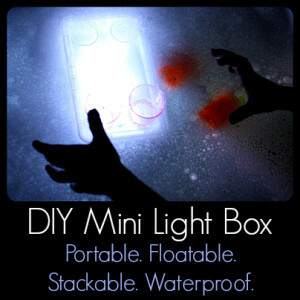 The Little Engineer very much enjoyed helping me customize the box I’ll be showing you below. I don’t know why, but I love pencil boxes. Maybe they remind me of buying school supplies, always a highlight of the year when I was a kid. Maybe it’s because you can generally pick them up for 99 cents (this one came from Target). 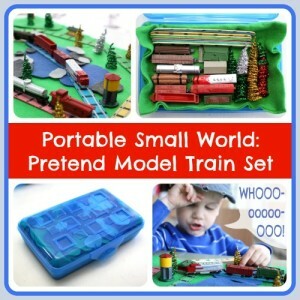 Whatever the reason, ever since I made our pretend model train set small world in a pencil box, I’ve often found myself packing up sets of toys in them for the Little Engineer to take places. But I never thought of putting full-sized toy trains into one until this week. I’m not sure why, because look how perfectly Thomas fits in there! All right, let’s open it up and see how much fits inside. I was surprised at how much I was able to fit in the pencil box. I was just aiming to get a circle of track and a wooden train or two in, but here we have an oval of track (two different ovals are possible), an engine, a freight car, freight, passengers, and more. 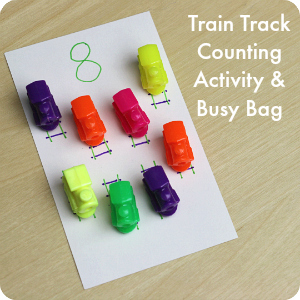 Eight small (3.5 inch) curved tracks: When you put the curved tracks in the pencil box,connect them in pairs, with the direction of the curve alternating in a reverse S-shape. To create the most room for accessories, align all the track pairs with the peg end curving upward toward the same side of the box. If you look closely at the photo above, you can see that some of the accessories are sort of tucked into that space beneath the pegs. Two 4-inch straight tracks and two 2-inch straight tracks (or four 3-in straight tracks, or two 6 inch straight tracks, or I suppose you could even do six 2-inch straight tracks, as long as you have two units of straight track that each measure 6 inches): Connect each of the 4-inch tracks with a 2-inch track, and orient their peg ends toward the same side as those of the curved tracks. One wooden engine: A short tank engine like Thomas — as opposed to a longer engine that most likely came with a coal tender — saves space here. 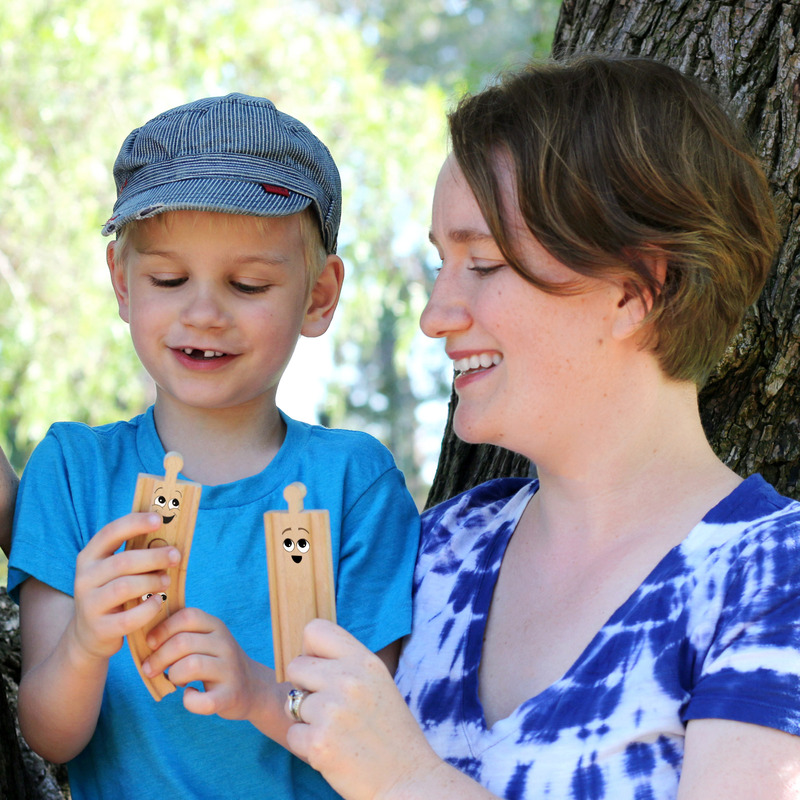 Small accessories: The Little Engineer and I choose a couple of blank peg dolls (the smaller “child” or “boy” size) and a few of our HABA wooden animals to be their pets. 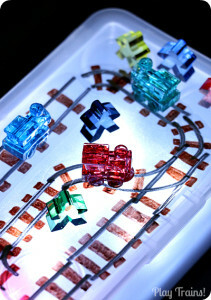 He also wanted to put in a die, which we used to play a modified version of one of his favorite games, Dice Cars. 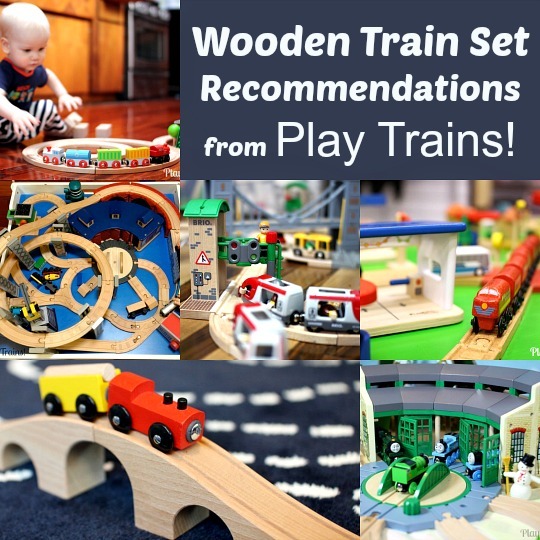 However, the possibilities as to what accessories you could add are nearly endless: cotton balls or pom poms to carry as freight or plow off the track, small rocks, glass gems, small animal figures, trees/people/signs from wooden train sets, other small wooden shapes, supplies to make one of our customizable Lego wooden trains or put Lego mini figures on trains, pipe cleaner trees — I could go on, and on, and on! To create the other track configuration, you move one size of straight tracks from the long sides of the oval to the ends, making it shorter and wider. Like I said, not a huge difference, but given the space constraints I was excited that there was an alternate layout. 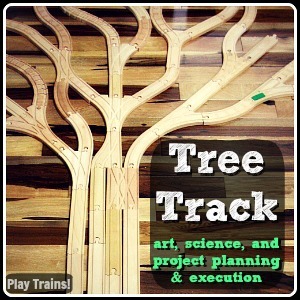 Of course, the track doesn’t have to connect up, which opens up the possibility of many more configurations! The Little Engineer must have been proud of this set, because he asked if he could pose with the pencil box for a photo for this post…only he was hamming it up so much that none of the photos turned out! Fortunately, I kept the camera handy while we played, and his hands can tell most of the story. Some of the ways he played were what I expected: imagined stations along the track, picking up and dropping off passengers and animals and wooden cube crates at them, a request for me to tell a story with him while we played, rolling the dice to see how many things he should put in the freight car. 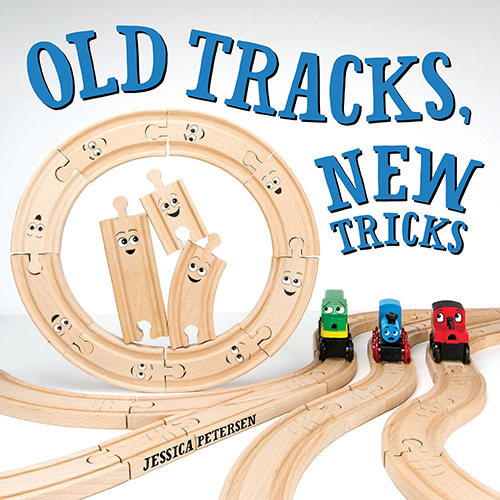 The other play idea he brought to my attention was that, when he was done playing, he could fit the track and trains back in the box by himself. It made a great puzzle for him to figure out — and he came up with a different way to fit it all in than I did! 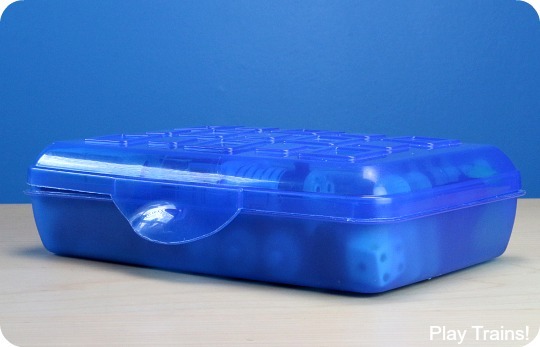 Of course, neither one of us realized that he was packing the pieces into the lid until he was done, and we couldn’t manage to close it without repacking into the bottom of the pencil box. Super cool. I am packing for an extended trip and had decided against bringing trains. Not anymore! Hooray! So glad this was helpful. Great idea, thanks! We’re going on a trip soon, and my Engineer will love taking something like this along. I absolutely love this idea! 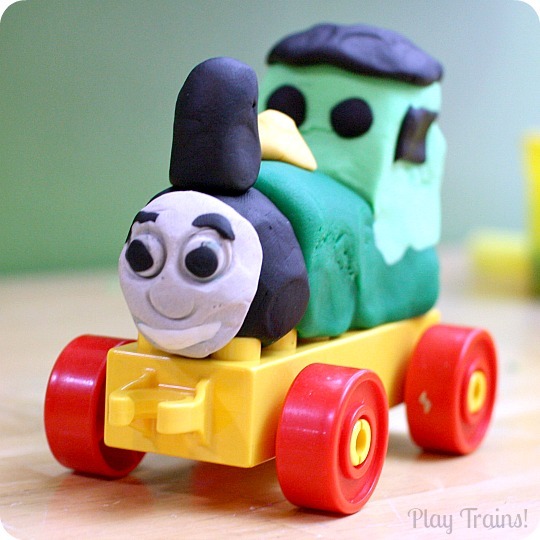 Wish I had thought of it when my son was super into Thomas. Got to share it! Thanks! And thank you for sharing! 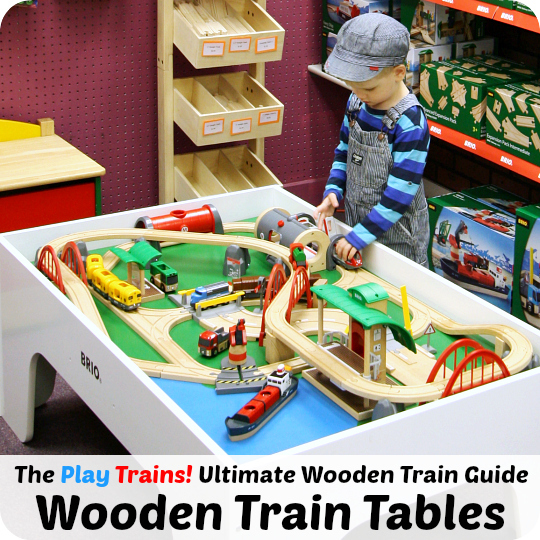 🙂 We’d often cart huge amounts of wooden train stuff places, and I knew there had to be a better way.